As a fan of NCIS from the beginning, I was skeptical that the show needed to or could be successfully spun off. At the same time, I was curious about the attempt. 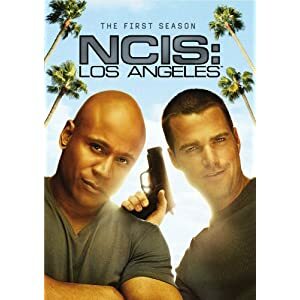 Employing a younger cast, NCIS: Los Angeles emphasizes on-location action over investigation, surveillance technology over forensics, while trying to port over NCIS‘s sense of camaraderie. As a mystery fan, I like investigation, but NCIS: L.A.‘s ratings success last season proves there are plenty of fans of its formula. Exec producer Shane Brennan, the cast, and crew speak of how well the show worked from the start, how perfect the actors were for their roles, but from where I sat, it took several episodes for the chemistry to develop. Not only was “Legend” lead actress Louise Lombard replaced by Linda Hunt in a more schoolmarmish role, but rookie agent Dominic Vaile (Adam Jamal Craig) went missing for several episodes and was ultimately killed. The episodes themselves went from a stand-alone to a more satisfying intertwined structure. I look forward to more progress in Season 2. One reason I wanted the Season 1 DVDs was to find out the producers’ vision for the show. The 6-disc set includes both parts of the back-door pilot “Legend,” Shane Brennan’s commentary on on the first episode, “Identity”, a handful of promo spots, an LL Cool J video, and five behind-the-scenes featurettes. If you think NCIS is okay but wish they got out more and relied less on forensics, NCIS: Los Angeles is your kind of show.